Jairajpuri ZS, Rana S, Hassan MJ, Nabi F, Jetley S. An Analysis of Hematological Parameters as a Diagnostic test for Malaria in Patients with Acute Febrile Illness: An Institutional Experience. Oman Med J 2014 Jan; 29(1):12-17. Objectives: Hematological changes are among the most common complications encountered in malaria. This study analyzes and statistically evaluates the hematological changes as a diagnostic test for malaria in patients with acute febrile illness and whether these could guide the physician to institute specific antimalarial treatment. Methods: The present study was an observational study, conducted from January to December 2012. A total of 723 patients presenting with acute febrile illness at our hospital were evaluated. A complete blood count and malarial parasite microscopy were performed for each patient. Results: The findings showed that 172 out of 723 patients (24%) were diagnosed to have malaria by positive smear report. There were 121 males and 51 females with a male to female ratio of 2.3:1. Maximum number of cases were seen in the 20-30 years age group. There was a statistically significant reduction in hemoglobin (p<0.005), platelet count (p<0.001) and total leukocyte count (p<0.001) levels in patients with malaria compared to those without the disease. Likelihood ratios for a positive result of platelets (6.2) and total leukocyte count (3.4) was relevant as compared to hemoglobin (1.61) and Red cell distribution width (1.79). The negative predictive values for hemoglobin (79%), total leukocyte count (86%), platelets (94%) and Red cell distribution width (93%) were significant. Red cell distribution width values were found to be higher in patients with malaria than in patients without malaria (p<0.001). Conclusion: This study revealed that routinely used laboratory findings such as hemoglobin, leukocytes, platelet counts and even red cell distribution width values can provide a diagnostic clue in a patient with acute febrile illness in endemic areas, thus increasing the probability of malaria and enhancing prompt initiation of treatment. Keywords: Malaria; Hematological parameters; Red cell Distribution Width. The clinical diagnosis of malaria is challenging because of the non-specific nature of the signs and symptoms, which overlap considerably with other febrile illnesses common in tropical regions. This impairs diagnostic specificity and often promotes the indiscriminate use of antimalarials. As parasites of the blood for the majority of their complex life cycle, they expectedly induce hematological alterations. Hematological abnormalities are considered a hallmark of malaria and statistical analyses have shown that many of these hematological values may lead to an increased clinical suspicion for malaria, thus initiating a prompt institution of specific therapy even in the absence of a positive smear report for malaria. Hematological changes are among the most common complications encountered in malaria.7,8 Prediction of the hematological changes enables the clinician to establish an effective and early therapeutic intervention in order to prevent the occurrence of major complications. These parameters are measurable indices of blood that serve as a marker for disease diagnosis.9 Abnormalities such as anemia and thrombocytopenia have been observed in patients with malaria.10 In this study, we analyzed and statistically evaluated the hematological changes in cases of malaria and whether they could guide physicians to institute specific antimalarial treatment. This observational study was conducted from January to December 2012. All patients with acute febrile illness presenting at Hakeem Abdul Hameed Centenary Hospital were evaluated. Patients with established diagnosis of systemic infections, typhoid fever, dengue fever, and meningitis were excluded from the study. A complete blood count (CBC) and malarial parasite microscopy were performed for each patient. CBC was done in a three part differential counter (KX-21), no abnormal result was reported. White blood cell differential was also done in each case. The peripheral smears were made and stained with Leishman’s stain. The slides were examined for malarial parasite identification. The slides were initially examined by a resident who was blinded from the CBC results. All malaria-positive smears were reviewed by a hematologist for confirmation, identification of species and review of smear for platelet count. Smear examination for malarial parasite was taken as the gold standard for the diagnosis of malaria. Statistical analysis was done using the Chi square test of significance which was applied to calculate p value. Sensitivity, specificity, positive and negative predictive values along with likelihood ratios (LR) for positive and negative test results were calculated for hematological parameters. The positive malaria group was composed of 121 males and 51 females with a male to female ratio of 2.3:1. The mean age of these patients was 29.2 years and the highest proportion (46%; 76 cases) was seen in the 20-30 years age group. Malarial cases were seen throughout the year; however, the maximum number of cases were seen in the month of September (49 cases; 28.4%), followed by July (30 cases; 17.4%) and August (23 cases;13.3%). An analysis of the hematological parameters was performed in patients with and without malaria (Table 2). The 95% confidence interval for each parameter along with p values are also shown in Table 2. There was a statistically significant reduction in hemoglobin (p<0.005), platelet count (p<0.001) and total leukocyte count (p<0.001) levels in patients with malaria compared to patients without the disease. The percentage of neutrophils in the subjects with malaria was significantly higher (p<0.005) than in the non-malaria group. The mean monocyte count was low in subjects with malaria but higher compared with the controls (p<0.001). Red cell distribution width values were assessed and found to be higher in patients with malaria than in patients without malaria (p<0.001). We obtained sensitivity, specificity, predictive values and likelihood ratio for diagnosis of malaria with the hematological parameters along with 95% confidence interval (Table 3). Anemia (Hb<10gm/dl) and leucopenia showed low sensitivity and moderate specificity, although high Red cell distribution width expressed high sensitivity and poor specificity in diagnosis of malaria. The presence of low platelet count (<100,000/mm3) was both 81% sensitive and 87% specific for the diagnosis of malaria with a likelihood ratio for a positive and negative test result of 6.55 and 0.2, respectively. The likelihood ratio for a positive test result of leucopenia was also relevant with a value of 3.4. Table 2: Baseline characteristics of hematological parameters in patients with and without malaria. Table 3: Sensitivity, Specificity, Predictive values and Likelihood ratio (LR) for diagnosis of malaria with the hematological parameters. Table 4: Combination of hematological parameters (Hb, TLC, Platelets, RDW) for diagnosis of malaria. Table 5: Post test probabilities of variables (post test probabilities of positive and negative test results when pre-test probability of malaria is 24%). The increase in malaria cases in the rainy (June-August) and post-rainy (September) seasons could be related to the emergence and increase in number of the female vector-Anopheles mosquito where biting rates and the rate of transmission of malaria parasites are expected to increase in the hot humid climatic conditions and warm stagnant water.17 Similar trends in our study were also observed. The clinical diagnosis of malaria is challenging because of the non-specific nature of the signs and symptoms, which overlap considerably with other febrile illnesses common in tropical regions. This impairs diagnostic specificity, and often promotes the indiscriminate use of antimalarials, thereby compromising the quality of care for patients with non-malarial fevers in endemic areas.18 Laboratory diagnosis of malaria is based upon the demonstration of the malarial parasite on microscopy which requires technical expertise and repeated smear examinations. Hematological abnormalities are considered a hallmark of malaria and statistical analyses have shown that many of these hematological values may lead to an increased clinical suspicion for malaria, thus initiating a prompt institution of specific therapy even in the absence of a positive smear report for malaria. A variety of hematological alterations like progressively increasing anemia, thrombocytopenia, leukocytosis or leukopenia have been reported in cases of malaria.19 Lower mean values for hemoglobin, leukocyte count and platelet count in the malaria group compared to the control group was observed in our study. This was in concordance with other studies.19,20 The present study demonstrated that different hematological variables (Hb <10, TLC <5000, RDW >15, Platelets <100,000) increase the probability of malaria when their LR for a positive result was calculated and this probability increased manifold when used in combination with a LR for a positive result of 7.2 when all four tests were positive. Lathia et al. 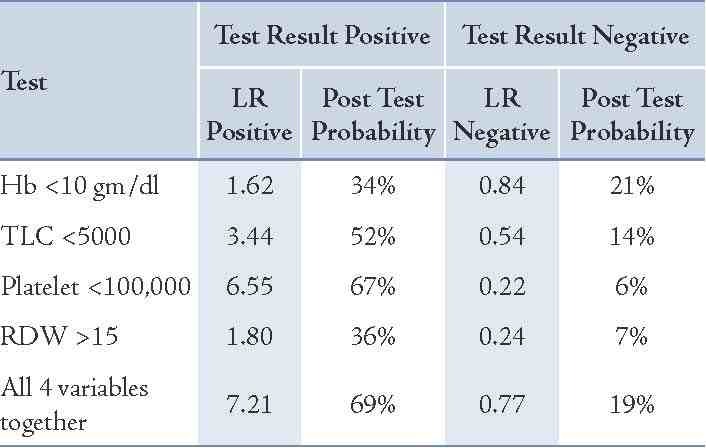 also evaluated LR for a positive result using a combination of tests and found it be more useful.20 The pre-test probability indicating the prevalence of the disease was 24% in the present study and post- test probability for Hb <10gm/dl, TLC <5000, Platelets <100,000 and RDW >15 were 34%, 52%, 67% and 36%, respectively. A post test probability for the four tests taken together was 69% with a likelihood ratio for a positive test of 7.2. Post-test probability can be very useful to the clinician for estimating the probability of the disease in their clinical settings and guide towards decision making with regards to treatment. Red cell distribution width (RDW) along with mean corpuscle volume (MCV) of red cells have appeared as new parameters to be studied in malaria. RDW describes the population dispersion of red cell volume or the range of changes in size of red blood cells which mostly present as enlarged after malarial invasion.19 In the present study RDW, values were found to be higher in the malaria group than the non-malarial cases in concordance with other study findings,19 however this was in contrast to the findings of Lathia et al.20 The opinions of authors differ on the sensitivity and specificity of RDW in malaria diagnosis, while some consider high RDW a poor marker,20 others do not.19 Although the role of RDW in the diagnosis of malaria is debatable, the presence of increased RDW has correlated well with the percentage of macrocytes in one study,30 hence a combination of RDW and MCV may be more helpful. However, MCV alone has not been found to be different between the two groups in the present study, as well as in other studies.19 Macrocytes were also not prominent in these studies including that of ours. The variation in RDW is attributed to infection of red cells by malaria parasites (especially P. vivax), where the cells become enlarged. The initial increases in size are followed by the rupture of the infected red cells. Since the cycle is never synchronous, parasites at more than one stage of development will usually be seen in the blood smear, hence, red cells of different sizes. This is not seen in P. falciparum malaria, were they retain their original size.19 As the majority of our cases were of P. vivax, this explains the increased red cell distribution width. Overall, the hematological aspects of malaria constitute a very interesting area. We observed that hematological changes such as anemia, thrombocytopenia and leucopenia showed a statistically significant correlation with malarial infection. We concluded that routinely used laboratory findings such as hemoglobin, leukocyte and platelet counts and even red cell distribution width values can provide a diagnostic clue in a patient with acute febrile illness in endemic areas, thus increasing the probability of correctly diagnosing malaria and enhancing prompt initiation of treatment. Because of limitation of resources and trained health personnel in much of the malaria infested areas, presumptive clinical diagnosis seems a relevant option. It would be interesting to further evaluate a larger sample size and detect, as well as compare differences between malaria infected and non-infected febrile cases. The authors would like to acknowledge the contributions of Mr. Akhileshwar Sharda and Mr. Asif Masood in this study. No conflict of interests or funding to declare. 1. Taylor-Robinson AW. Immunoregulation of malarial infection: balancing the vices and virtues. Int J Parasitol 1998 Jan;28(1):135-148. 2. Das LK, Pan SP. Clinical manifestation of severe form of P.falciparum malaria in Koraput district of Orissa state, India. J Vector Borne Dis 2006;43:104-143. 3. Dua VK, Kar PK, Sharma VP. Chloroquine resistant Plasmodium vivax malaria in India. Trop Med Int Health 1996 Dec;1(6):816-819. 4. Facer CA. Hematological aspects of malaria, In: Infection and Hematology. Oxford: Butterworth Heinmann Ltd., 1994. P. 259-94. 5. Perrin LH, Mackey LJ, Miescher PA. The hematology of malaria in man. Semin Hematol 1982 Apr;19(2):70-82. 6. Murphy GS, Oldfield EC III. Falciparum malaria. Infect Dis Clin North Am 1996 Dec;10(4):747-775. 7. Ali Hassan Abro. Abdulla MahmoodUstadi, NadeemJaveedYounis, Ahmed SalehAbdou, Dujana Al Hamed, Ahmed AlhajSaleh. Malaria and Hematological changes. Pak J Med Sci 2008;24:287-291. 8. Price RN, Simpson JA, Nosten F, Luxemburger C, Hkirjaroen L, ter Kuile F, et al. Factors contributing to anemia after uncomplicated falciparum malaria. Am J Trop Med Hyg 2001 Nov;65(5):614-622. 9. Petel U, Gandhi G, Friedman S. Thrombocytopenia in plasmodium malaria. Am J Trop Med Hyg 2004;59:859-865. 10. Ladhani S, Lowe B, Cole AO, Kowuondo K, Newton CR. Changes in white blood cells and platelets in children with falciparum malaria: relationship to disease outcome. Br J Haematol 2002 Dec;119(3):839-847. 11. Bell DR, Jorgensen P, Christophel EM, Palmer KL. Malaria risk: estimation of the malaria burden. Nature 2005 Sep;437(7056):E3-E4, discussion E4-E5. 12. Reyburn H, Mbakilwa H, Mwangi R, Mwerinde O, Olomi R, Drakeley C, et al. Rapid diagnostic tests compared with malaria microscopy for guiding outpatient treatment of febrile illness in Tanzania: randomised trial. BMJ 2007 Feb;334(7590):403. 13. Faseela TS, Ronald AR, Anita KB, Chaithra SM, Yashwanth R. Diagnostic Value of Platelet Count in Malaria. Journal of Clinical and Diagnostic Research 2011;5:464-466. 14. Malik AM, Zaffar N, Ali Nadir, Malik AM, Khan R. Hematological Findings And Endemicity of Malaria In Gadap Region. Journal of the college of Physians and Surgeons 2010; 20:112-116. 15. Beg MA, Sani N, Mehraj V, Jafri W, Khan MA, Malik A, et al. Comparative features and outcomes of malaria at a tertiary care hospital in Karachi, Pakistan. Int J Infect Dis 2008 Jan;12(1):37-42. 16. Yasinzai MI. KakarSuleman, Khel JK. Incidence of human malaria infection in northern hilly region of Baluchistan adjoining with NWFP Pakistan, district Zohb. Pak J Biol Sci 2008;15:1620-1624. 17. Yohannes M, Petros B. Urban malaria in Nazareth, Ethiopia: parasitological studies. Ethiop Med J 1996 Apr;34(2):83-91. 18. Tangpukdee N, Duangdee C, Wilairatana P, Krudsood S. Malaria diagnosis: a brief review. Korean J Parasitol 2009 Jun;47(2):93-102. 19. Koltas IS, Demirhindi H, Hazar S, Ozcan K. Supportive presumptive diagnosis of Plasmodium vivax malaria. Thrombocytopenia and red cell distribution width. Saudi Med J 2007 Apr;28(4):535-539. 20. Lathia TB, Joshi R. Can hematological parameters discriminate malaria from nonmalarious acute febrile illness in the tropics? Indian J Med Sci 2004 Jun;58(6):239-244. 21. Beales PF. Anaemia in malaria control: a practical approach. Ann Trop Med Parasitol 1997 Oct;91(7):713-718. 22. Perrin LH, Mackey LJ, Miescher PA. The hematology of malaria in man. Semin Hematol 1982 Apr;19(2):70-82. 23. Bashawri LA, Mandil AA, Bahnassy AA, Ahmed MA. Malaria: hematological aspects. Ann Saudi Med 2002 Sep-Nov;22(5-6):372-376. 24. McKenzie FE, Prudhomme WA, Magill AJ, Forney JR, Permpanich B, Lucas C, et al. White blood cell counts and malaria. J Infect Dis 2005 Jul;192(2):323-330. 25. George IO, Ewelike-Ezeani CS. Haematological changes in children with malaria infection in Nigeria. J. Med. Med. Sci. 2011;2:768-771. 26. Maina RN, Walsh D, Gaddy C, Hongo G, Waitumbi J, Otieno L, et al. Impact of Plasmodium falciparum infection on haematological parameters in children living in Western Kenya. Malar J 2010;9(Suppl 3):S4. 27. Abdalla SH. Peripheral blood and bone marrow leucocytes in Gambian children with malaria: numerical changes and evaluation of phagocytosis. Ann Trop Paediatr 1988 Dec;8(4):250-258. 28. Khan SJ, Abbass Y, Marwat MA. Thrombocytopenia as an Indicator of Malaria in Adult Population. Malaria Research and Treatment 2012, www.hindawi com /journals/mrt/2012 Article ID 405981, 4 pages. 29. Dhungat MP, Dhungat PP. Thrombocytopenia in Patients of Malaria – Correlation with type of Malaria and its Clinical Significance. Online International Interdisciplinary Research Journal 2013;3:21-26. 30. Bunyaratvej A, Butthep P, Bunyaratvej P. Cytometric analysis of blood cells from malaria-infected patients and in vitro infected blood. Cytometry 1993;14(1):81-85.